Where are Cameron’s ground troops? This 70,000 figure has been treated with scepticism if not outright derision in some quarters, not least among the anti-war left — most of whom, it must be said, have made little or no effort to get their heads around the complexities of the situation in Syria. They have proved all too ready to promote articles like this or this, apparently oblivious to the fact that by giving credence to such nonsense they were only undermining the case against war. For an informed analysis of the anti-Assad opposition forces we should turn to Charles Lister, author of the recently-published 500-page study The Syrian Jihad: Al-Qaeda, the Islamic State and the Evolution of an Insurgency. 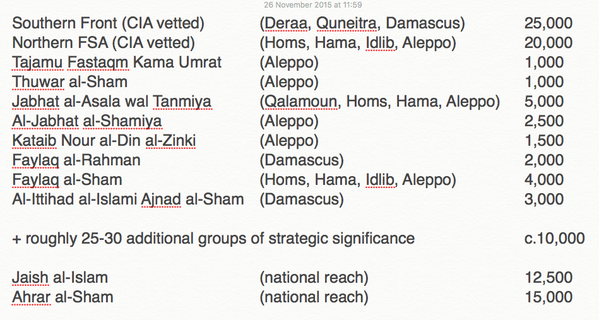 In response to the controversy over Cameron’s 70,000 figure, Lister tweeted a summary of the composition of the anti-Assad forces (see below) and presented a more detailed breakdown of the figures for the Spectator. It is clear that Cameron actually underestimates the number of potential fighters against Daesh, as he leaves out the two main Islamist militias, Ahrar al-Sham and Jaish al-Islam, presumably because he thinks they don’t qualify as moderates. (For Ahrar al-Sham’s objections to this miscategorisation see here, and for their emphasis on their anti-Daesh credentials see here.) On Lister’s figures, the total number of anti-Assad fighters who are opposed to Daesh (including Ahrar al-Sham and Jaish al-Islam, but leaving out the al-Qaeda affiliate Jabhat al-Nusra and other jihadi groups) comes to more than 100,000. The anti-Assad forces have a courageous record of resisting Daesh. Indeed, Cameron refers to their fierce battles with Daesh north of Aleppo in June this year — in which they received no support at all from US airstrikes. The US bombing campaign that Cameron is proposing to join has almost exclusively targeted Daesh forces in northern Syria. The anti-Assad resistance certainly aren’t going to head off to Raqqa and help Cameron destroy Daesh there until they’ve settled accounts with the regime in Damascus. In other words, the overthrow of Assad is the necessary precondition for the defeat of Daesh — the exact reverse of the sequence proposed by Cameron. Although for some reason Cameron didn’t see fit to mention it, these Kurdish forces are in reality the Syrian arm of the PKK, which has been a proscribed terrorist organisation in the UK since 2001. 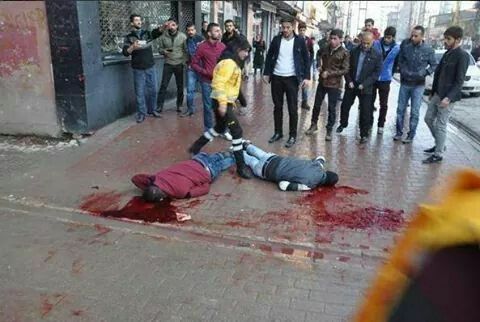 Here is how the PKK conducts the armed struggle in Turkey — killing unarmed, off-duty soldiers by shooting them in the head while they’re out doing their shopping. As for the PKK’s Syrian forces, earlier this year Amnesty International accused them of committing war crimes in the course of their fight against Daesh— “deliberately demolishing civilian homes, in some cases razing and burning entire villages, displacing their inhabitants with no justifiable military grounds … brazenly flouting international humanitarian law”. So here, finally, we have the answer to the foreign affairs committee’s question to Cameron: “Which ground forces will take, hold, and administer territories captured from Isil in Syria?” These will be the forces of a proscribed terrorist organisation that has been accused of war crimes. It is difficult to see how this can end well. Previous Post Did Martin Luther King believe criticising Zionists is antisemitic?